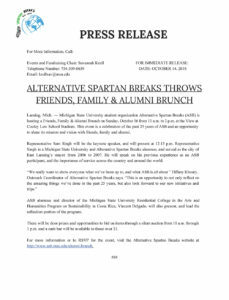 Alternative Spartan Breaks held a Friends, Family & Alumni Brunch in October, 2016. As a result of the press release that I created and distributed to local news, Fox 47 News attended our event and aired the coverage during the prime time news slot. Watch the coverage on Fox 47 News.